Today I'm going to take you back to the Hyde Park neighborhood of Chicago. We're going to take a quick look at the Museum of Science and Industry! Last time I was there was actually about a year ago for Christmas time so I thought it would be fitting to post this about now. While we were there Christmas Around the World and Holidays of Light was going on with fifty trees representing countries from around the world. 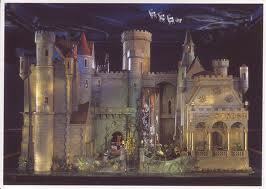 Two of my absolute favorite things to see at the MSI are the U-505 Submarine and Colleen Moore's Fairy Tale Castle. 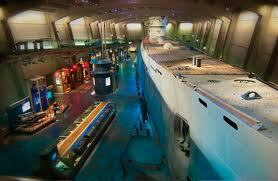 I remember going to see the U-505 waaaay back when it actually used to be outside and you could walk through the entire thing. They have now enclosed it, you can wander around the exhibit part for just your main entrance fee but to actually go inside for the tour is $8. The Fairy Tale is probably my absolute favorite thing. Built in the 1930's this thing is amazing it includes murals and paintings painted by Walt Disney himself; chandeliers adorned with real diamonds, emeralds and pearls; the tiniest bible ever to be written, dating back to 1840; and ancient statues more than 2,000 years old! Even if you can't make it check out the online tour it does a great job with images and descriptions. The MSI has something for everyone really, you can look at the coal mine shaft, learn about farming, see real chicks hatching (Always a popular one! ), go through dioramas of circuses, and so much more. This fall the special exhibit is Charlie Brown and the Great Exhibit. Having lived in Minnesota for a number of years (where Charles Schulz was born) this one looks like a must see. I would say the MSI is a must see but can get somewhat pricey with having to add on fun exhibits like the U-505, the Coal Mine and Charlie Brown. 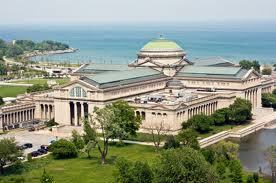 General Admission is only $15 per adult with a discount for Chicago residents and does get you into most everything. Like the Oriental Institute it can be a bit of a hike to get there since it's not close to the Loop but definitely worth the trip! Haha that last one of Kevin cracks me up! I've never been during the tree thing, it looks pretty. Our girl scout troop slept overnight there once, it was freaky. A lady took us walking through the coal mine thing, we flipped out!